Thinking of an avocado pesto is probably one of my most brilliant moments in life. I know, I know, I didn't discover this or "invent" it, but I didn't know that it even existed until the moment I was daydreaming about a summer pesto and googled "avocado pesto". So for the record, the idea I had was brilliant, but someone else was a genius! I found several recipes that inspired me to create something that was so tasty, delicious, refreshing, and light! Pesto can tend to be creamy and heavy leaving you with a great taste in your mouth but a gut that is very unhappy with you. Using the avocado creates the right creaminess and making it so fresh and giving you a meal with "good fats" rather than the bad ones. Get ready for this delicious summer pesto, I'm pretty sure it will rock your world! 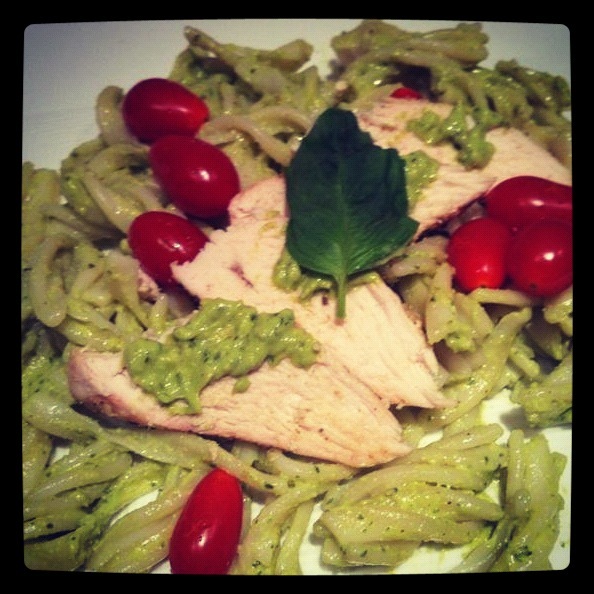 -The opportunites with this pesto are endless, I was dipping tomatoes in it all night long! Combine basil, pine nuts, avocado, lemon juice, oil, and garlic in a food processor and combine. *I did a few ingredients at a time to make sure my little chopper/processor could hand the work, but this allowed me to taste test and make sure I was getting the right taste. 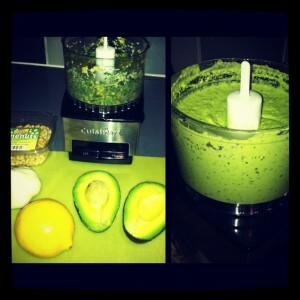 You can use a vitamin or BlendTec to blend as well.